i dont know sorry. prices could have change. besides i buy my tickets only from the internet. What are they gonna do print your name on with a printer????? Seems a good way to get rid of the touts, but have been to numerous euros + world cups where they're haven't been bothered by the name checks on tix. Last edited by BMWTaylor; 18-04-2006 at 06:14. Have registered with bestticket now, and understand they go onsale next Thursday, so will just try then. We came late to the hotel so we rushed few things a little bit and took a taxi. From Via buenos Aires it cost us 20E plus tip. The thing is that you can take a subway and for only 1E get to the stadium (15 minutes walk with other fans required though). If its derby i suggest not wearing any colors before you get to your seat because ultras look pretty rough and you don't wanna excercise your medical insurance. Shirts, scarfs, hats a pretty cheap, compairing to London and even New York...they are not original but you cant beat the price. 10E for a shirt, 5 for scarf and 5 or 10 for hat. Check for the local stores that sell sporting goods, like Nike, Diadora...They may have promotions and Milan players are coming as a guests. "Lotto" store had Dida and Cafu + two Inter players yesterday, but we had to leave two days prior to that. Food is pretty inexpensive...I liked turkish Kebab King on Via Vetruvio, big portions for around 4-7 Euro. I stayed in Best Western City Hotel which was very nice and clean and offered nice breakfast. One of the Inter players was Julio Cruz. Very cool of them to hold an autograph session, but I read on acmilan.com that the signing took place only a day or two before the derby. Is that practice quite common? Hi all, i'm going to the AC Milan v Roma game, flying out from Glasgow a week on Friday, anyway, i was wondering if anyone can help me, i'm wondering what the best seats are? Were you get a good view of the pitch and the fans (the Curva Sud and the AS fans). Last edited by scott_b_; 03-05-2006 at 15:52. Last edited by scott_b_; 03-05-2006 at 16:27. Got my tickets yesterday, in the orange section. Arctic Monkeys at Rolling Stone Sat night, Milan Roma Sunday! i'm wondering what the best seats are? Were you get a good view of the pitch and the fans (the Curva Sud and the AS fans). I don't understand what you prefer:see the Milan fans or the pitch? The real "Curva" is the 2nd blue ring..
Usually I go in 2nd ring (31€ for a ticket) either Red or Orange but for Milan-Barça I went to the 1st green ring and I had a wonderful view! I think that the most important thing is the sector of your seat..so look the map you posted before you buy the ticket! About the "touts issue",they still exist even if tickets are "nominal"..and lots of friends of mine still buy tickets from them without having problems...the only thing to remember is that you must recognize a real ticket from a fake one! 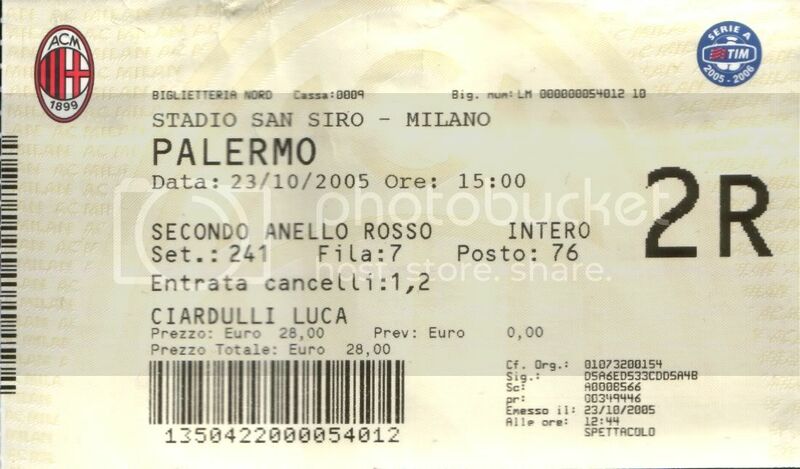 BTW,nowadays I prefer the safest way and I buy tickets at the Milan Point..but I used to buy tickets to touts before..
Last thing: now the "away supporters" seats are in the 3rd green ring (not for the Derby,where the green ring is the "Curva Nord",only for Inter supporters)..
Games in Scotland are nothing like Italy, there are no Ultras and Tifo actions, there is hardly any singing too these days and the atmosphere is terrible. If you want to see everything,I think the best places are at the 2nd ring (red or orange in sectors near the blue ring,so you'll be near the Curva and you can have a good view of everything).. I'll go for Milan-Roma too..but I'm planning to go to the 1st green ring.. I also have my tickets now !!! I will be in the green ring (it was impossible to get tickets for Roma section) WIll be a great match, but we are supporting the different team ! Cant wait, will be a cracking match ? Will the Roma fans be above i believe in the 3rd green ring, and the "first ring" is 2 tiers ? I guess, the green ring, will be full of foreign fans, as you can get them on-line. Look forward to it, and may the best team win ! Of course i hope thats Roma. I think it will be a draw, maybe ! If anyone can help me here, it will be greatly appreciated. Last edited by Giallorossi; 05-05-2006 at 23:52.